Update: From August 3, 2015 to August 16, 2015, we are offering our customers the opportunity to earn higher bonuses for successful referrals. 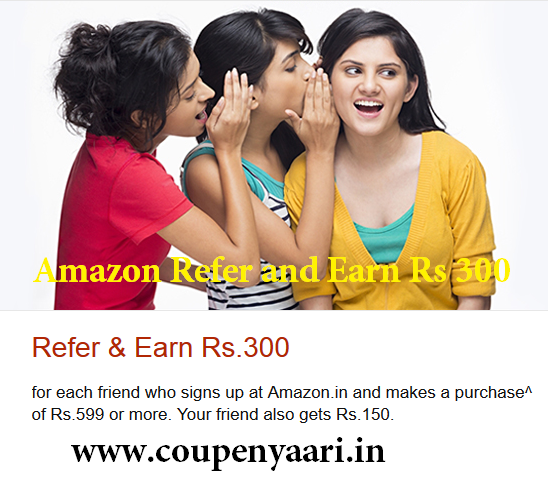 As part of this promotion, you can earn Rs.300 for each friend you refer to Amazon.in, while your friend gets Rs.150. What is the Amazon.in Refer and Earn Program ? The Amazon.in Refer and Earn Program lets you invite friends to join Amazon. For every friend you successfully refer to Amazon.in, you will receive a gift card worth Rs. 300, redeemable on the site. If your friends accept the invite, sign up at Amazon.in and complete their first purchase worth Rs. Rs.599 (excluding shipping, handling or gift-wrapping fees) or more, we will send you a Gift Card worth Rs.300* valid for purchases at Amazon.in. Additionally, we will also send your friends a Gift Card worth Rs.150*, once they have completed their first purchase. How can I refer Amazon.in to my friends? Invite via e-mail: On the Referral page, in the “Refer via e-mail” section, enter the e-mail ids of friends you wish to invite, and click “Send Invitation”. You can enter up to 5 e-mail ids in a single attempt. Share on Facebook: On the Referral page, click on “Share on Facebook”. You will be redirected to the Facebook login page. Once you log in, a link will be posted on your wall. Share this link with your Facebook friends to invite them to Amazon.in. Yes, you can invite any of your friends or acquaintances. However, to ensure that users don’t get spammed, please ensure that you only send invites to people you are acquainted with. You will receive a Gift Card issued via email within 30 days after the date the order has been shipped to a new Amazon.in member that you referred. Are there any restrictions on using the Gift Card to shop at Amazon.in? Gift Cards cannot be used to buy other gift cards or to pay shipping, handling, taxes or any other applicable transaction cost. For more information, please read the Amazon.in Gift Card Terms and Conditions. You can view your Gift Card balance and the associated details on the “Manage Your Gift Cards” page. Why did I not get a Gift Card for an invite that was accepted? The new accounts does not meet all Amazon.in Conditions of Use. Do I receive a referral bonus if a user I referred purchases a Kindle eBook? You will not receive a referral bonus on Kindle eBook purchases. I wish to create an account on Amazon.in via the referral link my friend has sent me. What do I need to do to accept the invite? e. You will need to complete your registration, create an account and place an order for at least Rs 599 (excluding shipping, handling and gift-wrapping fees) to avail the benefit of the Refer and Earn Program.